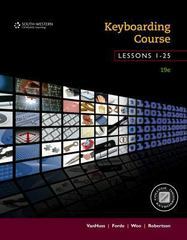 Keyboarding Course, Lessons 1-25: College Keyboarding 19 Edition Prepare for academic and career success with KEYBOARDING COURSE, LESSONS 1-25, 19th Edition. This market-leading text provides the tools you will need to build a strong foundation in alphabetic keyboarding and top-row numbers. Extra reinforcement, communication skills review, and an introduction to Windows 8 and web-based computing will get you ready for today's workplace. Correlates directly with new web-based KPDO software, available separately.